This book collects all of the winners in Pittsburgh Glass Institute's 1937 competition for best executed examples of glass in architecture, decoration and design previously published in the Architectural Forum and Pencil Points. 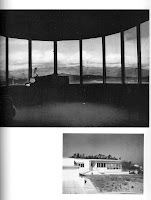 Included are 2 Julius Shulman photos of Richard Neutra's Grace Miller (Mensendieck) House in Palm Springs, Shulman Job No. 049 first published in the May 1937 issue of Architectural Record and later in the August 1937 issue of Architectural Forum and 2 of Raphael Soriano's Lipetz House in Los Angeles, Job No. 0149 first published in the August 1937 issue of Architectural Forum (see below). The book also contains other work by Neutra (Barsha House, Landfair Apts., and Scholts Advertising Building all with Arthur Luckhaus photos) and Harwell Hamilton Harris (Fellowship Park House with Fred Dapprich photos).